The study sought to confirm, the presence of harmful biomarker and free radical of trau-matic brain edema, malondialdehyde (MDA) in high levels within the brain tissue and plas-ma of brain injured as compared to normal brain tissue, and also its detrimental effect on brain, clinically. At the same time the study analyses the free radical – scavenging role of a pharmacological antioxidant agent called pentoxifylline, in terms of lowering the plasma levels of MDA and thereby clinical improvement. Biochemical estimation of plasma levels of malondialdehyde at regular intervals in all patients with traumatic brain edema showed de-creasing trend in plasma levels of patients (cases) receiving therapeutic doses of pharmacol-ogical agent, pentoxifylline. While as no change in high plasma levels of MDA was observed in traumatic brain edema patients (controls) on routine treatment (antiedema measures). This is an analysis of case – control study of 108 patients of traumatic brain edema, evalu-ated clinically by Glasgow coma scale (GCS) score, radiologically by serial computerized tomographic (CT) scans of the brain and biochemically by measuring plasma MDA levels in both, the cases (receiving pentoxifylline) and the controls (routine treatment).The youngest patient was 21 years of age, the oldest 66 years and most patients were in the age group of 21 to 45.There were only 12 female patients, six from each group. High morbidity was observed in both the groups, cases (pentoxifylline-group) and controls (control-group) but a mortality of 52.5% was observed in control-group of patients as compared to zero mortality in pen-toxifylline - group. This study confirms the beneficial role of pentoxifylline in patients of traumatic brain edema by antagonizing a product of lipid peroxidation, malondialdehyde. Brain edema occurs when water content of brain tissue is increased. There are four types of brain edema i.e, vasog-enic, cytotoxic, interstitial and osmotic [1,2,3,4]. Severe brain injury leads to brain edema which is usually irre-versible and leads to marked increase in intracranial pres-sure and death. The edema is initiated by the release of free-radicals which disrupt the microvascular network and blood brain barrier due to several biochemical reactions . The blood brain barrier is maintained by tight junc-tions between endothelial cells that line the vessels of the brain. The injury to these cells allows extravasation of fluid and proteins into the interstitial space of brain pa-renchyma . The free-iron is a key catalyst of free-radical mediated injury and is readily available in the in-jured and contused brain tissue . These include release of monoamines, oxygen free radicals, arachidonic acid metabolites, neuropeptides, excitatory aminoacids and changes in extracellular ions like calcium. These in turn initiate vicious cycles resulting in ? autodestruction? of the surrounding neurons. In addition, these chemicals are also responsible for the development of brain edema, cer-ebral circulatory and metabolic changes [1,2,3,4,8,9,10]. Also phagocytosis leads to increased NADPH via HMP-shunt, releasing free radicals which damage cell mem-brane and other biomolecules . Once initiated, free radical injury is a self perpetuating process with increas-ing damage, generating more free radicals . Among free-radical mediated injury markers, (like hyperglyce-mia, lacticacidosis, creatine-kinase BB, neurone specific enolase and S-100 Protein), one of the important markers is malondialdehyde (MDA), a product of lipid peroxida-tion, found in plasma and edematous brain tissue of brain injured patients [12,13,14,15,16]. High levels of mortality and morbidity are attributed to severe brain edema after primary injury [1,2,3,4]. If the secondary brain injury i.e, brain edema, be controlled by any means like pharmaco-therapy, mechanical-ventilation or surgery, the mortality and morbidity shall be limited. Antioxidants are en-dogenous or pharmacological agents capable of dampen-ing menace of free radicals . These are various kinds of enzymes, non-enzymes, xanthine derivatives (pentoxifyl-line), protease inhibitors, NADPH oxidase inhibitors, su-per-oxide dismutase etc. [18,19,20,21]. Anti-oxidant groups like 21-aminosteroids (lazaroids)-U 74006F and U 74500A have been shown to be potent inhibitors of lipid-peroxidation, with an efficacy greater than that of the glu-cocorticoid steroid i.e, methylprednisolone [22,23]. Anti-oxidants like pentoxifylline have been found very effec-tive in restricting brain edema after initial trauma with a better outcome in severe brain injury by facilitating microcirculation and oxygen consumption [24,25]. Pen-toxifylline is an antioxidant, a free radical scavenger, first used for the treatment of intermittent claudication in United States of America . It is a xanthine derivative . This study in the Department of Neurosurgery SKIMS, Kashmir was initiated to confirm the role of pharmacological agent, pentoxifylline, in combating the harmful effect of oxidant like malondialdehyde (MDA) on injured brain by serially assessing brain tissue and plasma levels of MDA, serial check CT-scans of brain and repeated clinical examinations. This is hypothesized that malondialdehyde has a significant role in inducing edema in traumatic brain injury patients and that pentoxi-fylline dampens its effect in favour of survival of these patients. This prospective case-control study of 108 traumatic brain edema patients, from Jan., 2005 to Dec., 2007 (a period of two years), was carried out in the Department of Neu-rosurgery, Sher-I-Kashmir Institute of Medical Sciences (SKIMS), Srinagar, Kashmir, India. All traumatic brain edema patients who were managed conservatively became part of the study. Clinically patients were assessed by re-peated examinations and Glasgow Coma Scale (GCS) score . Those 68 patients, out of total 108, who were managed on the pharmacological agent pentoxifylline in addition to routine treatment (anti-edema measures), were called pentoxifylline-group. The pentoxifylline was given as intravenous infusion of 300 mg (15 ml) dose in 300 ml normal saline over a period of 3 hours at a frequency of 8 hourly intervals. Alternatively 400 mg tablets at 8 hourly intervals were given through nasogastric tube. The re-mainder 40 patients of total 108 traumatic brain edema patients were managed by the routine treatment (anti-edema measures) only and were known as control-group. Both the pentoxifylline and control groups were subjected to serial plasma MDA level assessments at regular inter-vals. All those traumatic brain edema patients who were children (below 18 years), pregnant women, alcoholics or had cerebrospinal fluid (CSF) leaks, pneumocephalus and intracranial hematomas whether requiring surgical de-compression or not, were not included in the study. Since those traumatic brain edema patients (n=40) who required surgery as a result of intracranial hematomas were not included in the study so they were used as non-study con-trols for the detection and confirmation of abnormally high MDA-levels in their injured brain tissue. Similarly 40 patients of brain tumors (gliomas) who needed surgery were taken up as non-study controls, for the estimation of MDA-levels in normal brain tissue after securing their (patient and or relatives) written consent. Intraoperatively a 1mm x 1mm x 1mm thick block of brain tissue was ac-quired for estimation of MDA levels and results com-pared. The plasma and brain tissue malondialdehyde (MDA) levels were estimated calorimetrically by the me-thod of Kahn and Menglo (1979). The observations were recorded, data analysed and evaluated by the statistical tests like student?s T-test. The Analysis of Variance was used where ever applicable. A total of 108 patients were studied, varing in age from 21 years to 66 years, most of them males and only 12 fe-males, 6 each from pentoxifylline and control groups. Most common age group involved was 21 to 45 years The normal brain tissue MDA-levels of 35 out of 40 non-study controls were less than 0.05 micromols / mg of brain tis-sue while the other 5 out of 40 had 0.12 to 0.21. 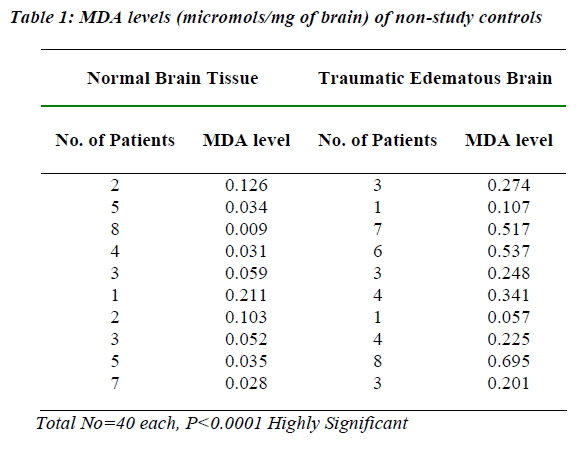 The brain tissue MDA levels of 40 traumatic brain edema non-study controls were very high with 21 out of 40 having 0.51 to 0.69 micromols / mg and 17 out of 40 had 0.20 to 0.34, while only 2 out of 40 had a level of less than 0.20. Com-paratively the two groups showed a significant statistical difference with a p-value of < 0.00001 (Table 1). Comparing mean plasma MDA levels of pentoxifylline and control groups, about 60.2% (41 out of 68) patients of pentoxifylline group had a level below 15.9 nmols /lit., 36.7% (25 out of 68) below 20.7 and only 2.9% (2 out of 68) patients had a level of 21.4 nmols /lit. While mean plasma MDA levels of 40% (16 out of 40) patients of control group were 30.6 nmols /lit., 27.5% (11 out of 40) had 29.8, 10% (4 out of 40) had 28.6, 15% (6 out of 40) had 24.5 and 7.5% (3 out of 40) had a level of about 22.5 nmols /lit. 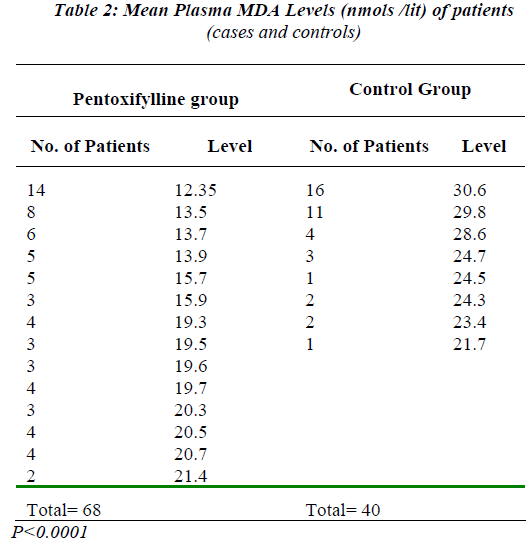 Thus pentoxifylline group of patients had lower plasma MDA levels than patients of control group at different intervals (Table-2). Clinically 52.9% (36 out of 68) patients of pentoxifylline group on admission had a GCS score 8 and below and at the end of two weeks, 48.6%(33 out of 68) had still same score. Whereas 40%(16 out of 40) patients of control group on admission with GCS score 8 and below in-creased to 60%(24 out of 40) at the end of two weeks, worsening clinical picture. Most of the patients of GCS score 9-12 had either improved or worsened so both the groups showed decrease in the number of patients at the end of two weeks. But a significant improvement was seen in the number of pentoxifylline group of patients with GCS score 13-15 from the time of admission(17.7% - 12 out of 68) to hospital till the end of 2nd week(36.7%- 25 out of 68). This is compared to the control group of patients where figures improved from 25%(10 out of 40) on admission to only 30%(12 out of 40) at the end of 2nd week (Table 3). Also focal neurodeficit, cranial nerve paresis, hemiparesis, haemodynamic status, pupillary size and other clinical parameters improved in pentoxifylline-group. All patients with a GCS score of 8 and below were electively-ventilated and tracheostomy performed when-ever required. All the 108 patients (both pentoxifylline and control groups) underwent plain CT-Scan of brain at admission and were subjected to check CT brain as and when neces-sary depending upon the neurological status of the patient. Repeat scans were performed in total 84 (77.7%) patients, 48(70.6%) from pentoxifylline ?group and 36(90.0%) from control-group. A total of 120 check Scans were per-formed on a total of 84 patients within 2 weeks of their admission and most scans(58%) were performed within 4 days of trauma. Serial CT-Scans brain were analysed critically for intrac-ranial haemorrhages (H), ventricular compression (VC), midline shift (MS), cisternal obliteration (CO) and brain edema (E) in both the groups (Table-4). Brain edema was found in all 68(100%) patients of pentoxifylline group in both admission-CT and first check CT scan but second check-scan showed that only 55.8% (38 out of 68) pa-tients had brain edema with an over all 44.2% (30 out of 68) improvement. While brain edema in all 100% (all 40) patients of control group was persisting in admission-CT and first check scan while as 92.5% (37 out of 40) pa-tients had edema in second check scan, revealing an only 7.5% (3 out of 40) improvement. However a single pa-tient from control-group was subjected to check-scan for the 4th time also. Table 4: Serial Plain CT (Computed Tomographic) Scans in all 108 patients. 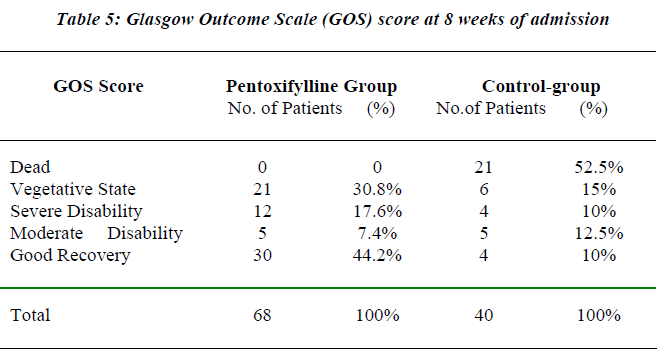 Glasgow Outcome Scale (GOS) score  applied to all 108 patients in both groups revealed 52.5% (21 out of 40 patients) mortality in control-group as compared to zero mortality in pentoxifylline group (Table-5) . But 30.8% (21 out of 68) patients of pentoxifylline group were in vegetative state as compared to 15% (6 out of 40) patients in control group. Disability of moderate and severe grades were found in 25% (17 out of 68) pentoxifylline group and 22.5% (9 out of 40) control group of patients. Good recovery was depicted in 44.2% (30 out of 68) patients of pentoxifylline group in comparison to only 10% (4 out of 40) of control-group. This shows that pentoxifylline has an effective role in survival of brain injury patients. About 35 patients from both groups, on mechanical venti-lation with tracheostomies, developed sepsis. After cul-ture sensitivity and treatment with proper antibiotics, only 14 patients could make it to recovery, while 12 patients succumbed to sepsis and 9 to malignant brain edema, all from control group. The brain bulk enlargement following head injury origi-nates from acute brain edema and an increase of the cere-bral blood flow or from the combination of the two. The occurrence of diffuse traumatic brain edema is still a mat-ter of dispute. Thus traumatic brain edema is multifacto-rial . The most important part of mechanism of sec-ondary brain injury is formation of free radicals . The cellular mechanisms of secondary brain injury contribute to brain edema . The vasogenic edema is more promi-nent,although cytotoxic edema also sets in finally . Accompanying venous blockage and obstruction leads to increase in edema and rise in intracranial pressure, inturn leading to increase in venous stasis and then a vicious cycle sets-in. The depressed respiration, carbondioxide accumulation, hypoxia and circulatory failure increase edema and intracranial pressure with resultant deteriora-tion in clinical status. Finally loss of intracellular potas-sium to extracellular space and ingress of chlorides and water into cell, aided by neuropeptides in the area leads to cytotoxic edema. This again leads to hypoxia, hypome-tabolism, anaerobic metabolism, accumulation of lactic acid and all types of free-radicals . Malondialdehyde (MDA), a free radical and a product of lipid peroxidation released in brain injury, is one of the most abundant carbonyl products which can react with DNA to form adducts with deoxyguanosine and de-oxyadenosine [12,13,30].The observations of the present SKIMS-study revealed inceased levels of malondialde-hyde (MDA) in the brain tissue of 40 traumatic brain edema patients as compared to the lower levels of 40 normal subjects and 68 patients of pentoxifylline group [Tables 1 & 2] . In general, following head trauma, the events are increased vascular permeability, enhancement of driving forces inducing bulk flow of fluids into the in-terstitial space and retention of fluid. Increased endothe-lial permeability is suggested to be due to chemical me-diators amongst which oxygen free radicals appear to play an important role [31,32]. Almost every type of treatment has been tried in such a situation, but failure rates are very high even with multipronged management. From hyper-ventilation to control of seizures and maintenance of temperature and fluid balance like preventive measures have not born fruitfull results. Controlled ventilation, hy-pothermia, steroids, peritoneal dialysis, free-radical scav-engers, lazaroids, nimodipine, extensive decompressive craniectomy etc. have all been applied but results are disappointing with high mortality [33,34,35]. In general there seems to be an agreement among neurosurgeons that heroic surgical decompressive measures are seldom help-ful . Pharmacological free-radical scavenging agents have been effective in reducing neuronal damage in animal models of brain injury . There have been suggestions to initiate clinical trials of antioxidants or NMDA (N-methyl-D-aspartate) antagonists as prophylactic agents . The pharmacological agent pentoxifylline has been used as an antioxidant in various clinical therapies includ-ing brain [24,37]. The SKIMS- study observed that pen-toxifylline (antioxidant) group of 68 patients showed de-crease in plasma MDA levels, clinical (GCS score) recov-ery, radiological (serial CT scans) improvement and better survival than the control group of 40 patients and is statis-tically significant with a p value < 0.00001 [Table 3, 4 & 5]. The brain edema, after traumatic brain injury, is often maximal at 24 to 48 hours . The present SKIMS- study observed that 120 check scans were performed on a total of 84 patients within 2 weeks of their admission to the hospital and 58%(69 out of 120) scans of all were per-formed within 4 days of the admission which showed brain edema in all cases (Table 4). The out come was as-sessed by Glasgow Outcome Scale (GOS) score . Although in this study pentoxifylline group showed good recovery in 44.2%(30 out of 68) patients and no mortality as compared to only 10% (4 out of 40) good recovery and 52.5%(21 out of 40) mortality among patients of control group but pentoxifylline group had more number of pa-tients in vegetative state (30.8%) and with disabilities (25%) comparably. This can be attributed to the fact that more patients with severe brain trauma and very low GCS score were salvaged in pentoxifylline group (36 out of 68 = 52.9%). The results are promising and further studies are needed to evaluate the benefits of molecule pentoxifylline in traumatic brain edema. The relationship between trau-matic brain edema, MDA levels and mortality is estab-lished. The conclusion is that Pentoxifylline has shown promising results in the survival of patients with trau-matic brain edema as a free-radical scavenger and effec-tive antioxidant, although its role needs further evalua-tion. We favour its routine use in traumatic brain edema. It is easily available, economically cost effective and can be used enterally and parenterally. Flamm ES, Demopoulos HB, Seligman ML, Ranoshoff J. Free Radicals in Cerebral Ishemia. STROKE 1978; 9: 445-447. Ikeda Y, Anderson JH, Long DM. Oxygen Free Radi-cals in the genesis of Traumatic and Peritumoral Brain Edema. Neurosurgery 1989; 24: 769-785. Mohanty S, Mazumdar S. Role of Serotinin in human cerebral Edema and contusions. Ind J Med Res 1978; 67, 1029-1032. Mohanty S, Dey PK, Sharma HS, Singh S, Chansouria JP, Olsson Y. Role of Histamine in Traumatic Brain Edema. An experimental study in the rat. J Neurol Sci 1989; 90: 87-97. Holley AE, Cheeseman KH. Measuring Free Radical Reactions in Vivo. Brit Med Bull 1993: 9: 494-505. Marmarou A. Traumatic Brain Edema. An Overview. Acta Neurochir Suppl (wien) 1994; 60: 421-424. Ercan M, Inci S, Kilinc K, Palaoglu S, Aypar U. Ni-modipine attenuates lipid peroxidation during the acute phase of head trauma in rats. Neurosurg Rev 2001 July; 24: 127-30. Demopoulos HB, Flamm E, Seligman M, Pietronigro DD, Tomasula J, DeCrescito V. Free radical pathology in the central nervous system disorders: effect of very high doses of methylprednisolone on the functional outcome, morphology and chemistry of experimental spinal cord impact injury. Can J physiol Pharmacol 1982; 60: 1415-1424. Faden AI, Demediuk P, Panter SS, Vink R. The role of Excitatory Aminoacids and NMDA receptors in trau-matic brain injury. Science 1989; 244: 789-800. Ikeda Y, Long DM. The molecular basis of brain injury and brain edema. The role of oxygen Free Radicals. Neurosurgery 1990; 27: 1-11. Costa JL, Ito U, Spatz M, Klatzo I, Demirjian C: 5-Hydroxytryptamine accumulation in Cerebro Vascular injury. Nature 1974; 248: 135-136. Delfino RJ, Sioutas C, Malik S. Potential Role of Ul-trafine particle in Association between Airborn particle mass and cardiovascular health . Environmental Health Perspectives 2005; 113: 934-946. Richard Deitrich, Sergey Zimatkin, Sergey Pronko: Oxidation of Ethanol in the brain and its consequences. Alcohol Research & Health 2006; 29: 266-273. Agarwal S. Biochemical Markers in Headinjures, Neu-rol (India) 1993; 41: 23-26. Lam AM, Winn HR, Cnullen BF. Hyperglycaemia and neurological outcome in patients with head injury. J Neurosurgery 1991: 75: 545. Young B, Ott L, Dempsey R, Haack D, Tibbs P. Rela-tionship between admission hyperglycaemia and neu-rologic outcome of severely brain injured patients. Ann Surg 1989; 210: 466-473. M Sambasivan, B Ramamurthi. Traumatic Brain Ede-ma. Headinjuries. Trauma-Section I in: Text Book of Neurosurgery. (Eds) B Ramamurthi, PN Tandon 1996 ; P 256-257. Atsuhiro Sakamoto, S Tsuyoshi Ohnishi, Tomo Ohni-shi, Rio Ogawa. Protective effect of a new antioxidant on the rat brain exposed to ischemia-reperfusion injury: inhibition of free radical formation and lipid peroxida-tion. Free Radical Biol and Med 1991; 11: 385-391. Berry KP, Braughter JM, Hall ED. Protection against post-Ischemic mortality and neuronal necrosis in ger-bils by the 21-9 P5 Aminosteroid U74006F, a potent inhibitor oF Lipid-Peroxidation.. Neuroscience Ab-stract 1987; 13: 1494. Hall ED, Yonkers PA, McCall JM, Braughler JM. Ef-fects of the 21-aminosteroid U7400 6F on experimental head injury in mice. J Neurosurg 1988 March; 68(3): 456-461. Mohanty S, Dey Pk, Ray AK. Role of Serotinin in Cerebral Edema. Modification by P-CPA, a 5-HT rece-ptor Blocker. Indan J Med Res. 1979 June; 69: 1001-1007. Dimlich RV, Tornheim PA, Kindel RM, Hall ED, Braughler JM, McCall JM. Effects of a 21- Aminos-teroid (U7400 6F) on Cerebral metabolites and edema after severe experimental head trauma. Adv Neurol 1990; 52: 365-375. Hall ED. Lazaroids novel cerebroprotective antioxi-dants. In: Emerging Strategies in Neuroprotection. (Eds) Marangos PJ, Harbans Lal, Birkhauser, 1992 P 224. Samlaska CP, Winfield EA. Pentoxifylline. J of Am Acad of Dermatol. 1994 April; 30(4): 603-621. Knezevic S, Maximilian VA, Mubrin Z, Prohovnik I, Wade J (eds.). Cerebral circulation. In: Handbook of Regional Cerebral Blood Flow. Lawrence Erlbaum As-sociates Publishers, Hillsdale, Newjersey Hove and London; 1988. Charles S Lieber. Alcohol and Hepatitis?C. Alcohol Research and Health 2001; 25: 245-254. Teasdale G, Jennett B. Assessment of coma and im-pairedconsciousness A practical scale. Lancet 2: 81- 84, 1974. Greenfield JG. Discussion: Brain Oedema in neurosur-gery . Proc Royal Soc Med 1947; 40 : 684-689. Langfitt TW, Tannenbaum HM, Kassell NF. The etiol-ogy of acute brain swelling following experimental head injury. J Neurosurg 1966; 24: 47-56. Linda A. McCauley, Anger WK, Mathew K, Langely R, Robson MG, Rohlman DS. Studying health outcome in farmworker populations exposed to pesticides. Envi-ronmental Health Perspectives 2006 June;114: 953-960. Au AM, Chan PH, Fishman RA. Stimulation of Phos-photase A2 activity by oxygen-derived free radicals in isolated brain capillaries J Cell Biochem 1985; 27: 449-453. Chan PH, Fishman RA. Oxygen free radicals : Potential edema mediators in brain injury. In : Brain Edema, (Eds.) Inaba Y, Klatzo I, Spatz M. Berlin, Springer-Verlag 1985; 317-323. El Banhawy A. Peritoneal Dialysis in brain edema. Medicine and Medicaments Courier, 1964; 1: 11-13. Clark K, Nash TM, Hutchison GC. The failure of cir-cumferential craniotomy in acute traumatic cerebral swelling. J Neurosurg 1968; 29: 367-371. Kerr FWL. Radical decompression and dural grafting in severe cerebral Edema. Mayo Clin Proc 1968; 43: 852-864. Tandon PN. Head injury management : whither next ? Neurol (India) 1994; 42: 65-68. Jennett B, Bond MR. Assessment of Outcome after severe brain damage. Lancet 1975; 1: 480- 484.